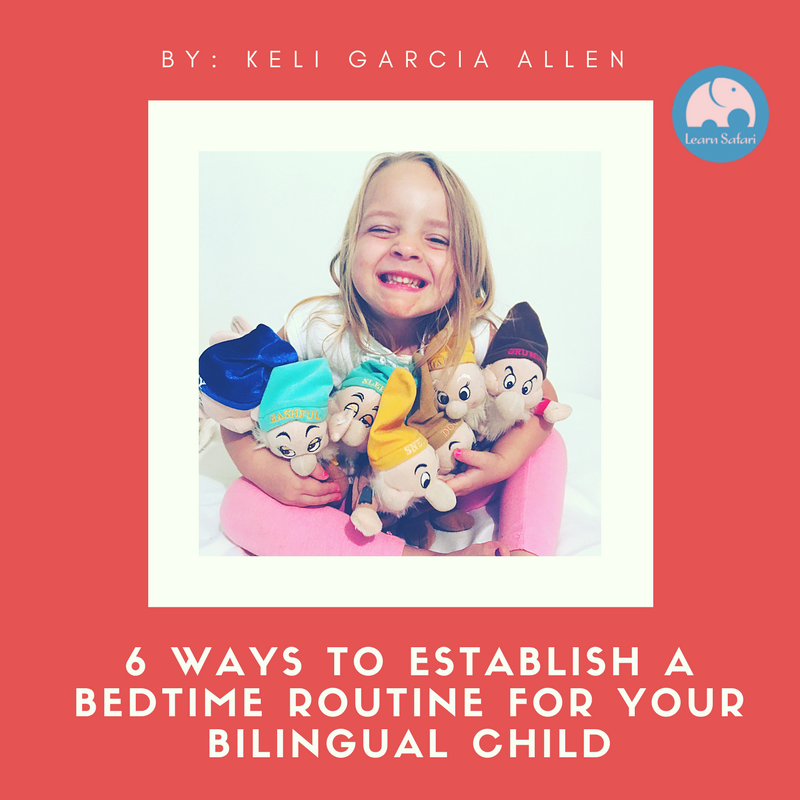 As promised in my post 6 Ways in which a Bedtime Routine Can Boost Your Bilingual Child I’m here to share some ideas on how to establish a bedtime routine. If you do not have a routine, then you really are missing out on a great opportunity to teach not only discipline and regain your sanity at night, but you're missing out on a great opportunity to expose your child(ren) to the target language. If you are anything like me, you often feel like rushing through the night and getting the kiddos to sleep so you can finally have some peace and a much needed break! I would try to use the time to clean up their substantial mess, get some of my work done, and even get some couch potato T.V. time. But honestly, the time of getting the kids to bed would stress me out, my kids never wanted to go to bed and were super cranky, and by the time I was done I was extremely tired and rarely followed through with my plans. Working with children, I know the importance of routines. I know that they do better when they know what to expect and what is expected of them, so why wasn’t I applying this to my own children when we were trying to wrap up the day? Once I decided to implement our routine at night, I found time to spend time learning and to actually enjoy my children! So, here is the routine that works for us and it’s my hope that you can get some ideas from it and create a routine that works for you. I wrote a post for Cooking with Languages a while back on what children can learn from cooking. 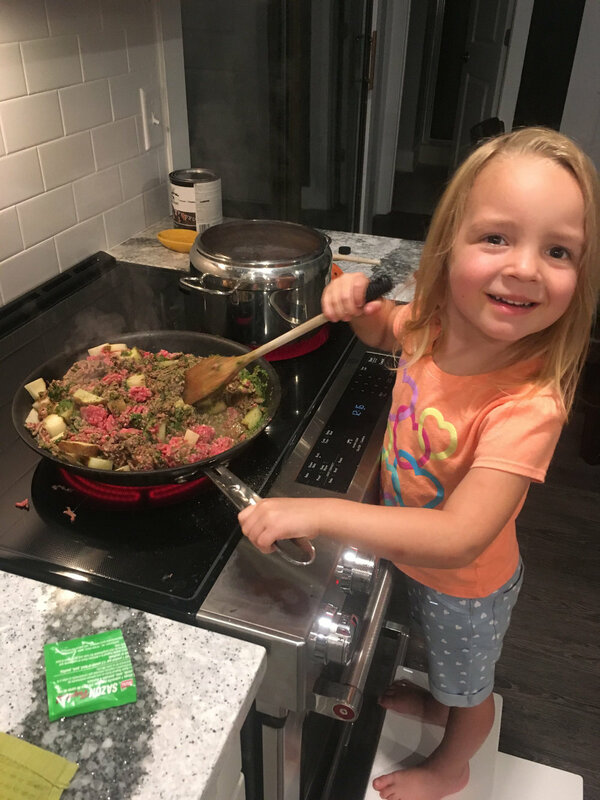 It was meaningful for me to write, because cooking with our kids provides such a special opportunity to bond and extend the time learning and practicing the target language. This is not an activity that is merely for older kids, but even the tiniest of tots can join in! My two and three year olds love to pour, crack (eggs), stir, and taste right along with me. Sometimes everything has been cooking on the crock pot all day, and they just get to stir a few times in order to “help” and sometimes we grabbed take out and they just need to set the table. Whatever we do, they always get to help and as they grow, their duties will grow with their abilities. During this time I use parallel and self-talk in our target language (Spanish) to describe everything we are doing as we cook. I also ask them a lot of open-ended questions about the process (What are you doing? Why do you have to do that?) and watch their little brains workout how to answer me. Obviously, the conversations will evolve as their language skills evolve and I foresee a time when our conversations will go well beyond what we are cooking. Oh dreaded clean-up! This is where I spend the majority of my time at home. With two professional mess-makers, it’s no wonder. It’s important to teach our kids from an early age to clean up and contribute to the house, but it’s never too late to start. Sometimes it really is like pulling teeth for me and it takes no small amount of patience, deep breathing, and chocolate (which I hide and eat in my bedroom closet!!) to get through this part of our routine. For now, it is all about me teaching them and indicating exactly what to do every step of the way, but I know that as they grow up, they will be able to do a lot more with a lot less prodding (as long as I keep up the routine!). For now, it’s another great opportunity for us to make practical use of our target language. At this point of our evening, I get the girls to help prepare themselves for tomorrow. We pull out pajamas and clothing for the next day. My threenager has developed her own style and takes a long time to put together her outrageous combinations for the following day (Boots with shorts are a current Florida winter favorite of hers) and it cuts down on morning rush (yeah, so I may have it “together” at night, but our mornings are RIDICULOUS! Can’t have it all right?). This is also a time when we prepare book bags and lunch boxes for the next day. We have a lot of fun and silly conversations in the target language during this portion of our night, and they are usually revolved around the crazy outfits my baby wants to wear. So, while my kids are little, bath time has to be supervised. Honestly, I wish I could just throw them in and walk away or rush them through it. But they love their baths so much and it’s really a great time for them to play while I sit with a book or (GAASSSPPP!) my phone. If you’re an over-achiever, go ahead and use this time to play and talk with your kids. It’s definitely what I recommend. So, do as I say, not as I do!! So, my excuse for taking it easy during bath time is that the next part of our routine is CRUCIAL! Seriously, whether you are a bilingual parent or not, reading every single day with your child is the single most important thing you can do for their education. Whether 0 or 17, reading aloud every single day should be the goal. It doesn’t matter if you read to them or they read to you, reading every day can make a bigger difference than anything else you do for them. Reading with your child every day has a greater impact on achievement than anything else you may do, including the school they go to, the extracurricular activities they participate in, how much money you make, etc. And as a bilingual parent, this is the best opportunity for my girls to receive rich, deep, and crucial input in the target language. After reading and talking about what we read, we spend some time talking about the day. I ask them a lot of questions and try to remind them of everything that was done. I ask them what their favorite part of the day was, what they didn’t like, what made them laugh, what made them sad, etc. I love to ask them silly questions to make them laugh and more serious questions to make them think. If you’re having a hard time coming up with questions, check out this article! I also talk to them about the next day and what they think they are going to do. I ask about what they would like to do and talk to them about what they must do. We do all of this in our target language and if they do not know how to say something, I let them say it in English and then I model how to say it in Spanish. It’s a very sweet time spent with them and it’s my absolute favorite part of the day. Taking the time to have a purposeful and meaningful time with your kids in the evening may seem like a daunting task, but remember, it does not have to take hours of your time. While it may at first be difficult to get your children to help with the clean up and preparing for the following day (especially if they are younger), but with a routine, it will end up being a lot of help and saving you time. If you go about the routine with the purpose of spending time and educating your children, it will also be less stressful! Taking the time to relax, read, and reflect upon the day with your child will also help you unwind and decompress while cuddling and hugging your babies will sure boost up those endorphins! And hey, there’s nothing wrong with getting the process started early. I’ve been known to enforce a 7pm bedtime routine and have lived to tell the tale! We want to hear from you! 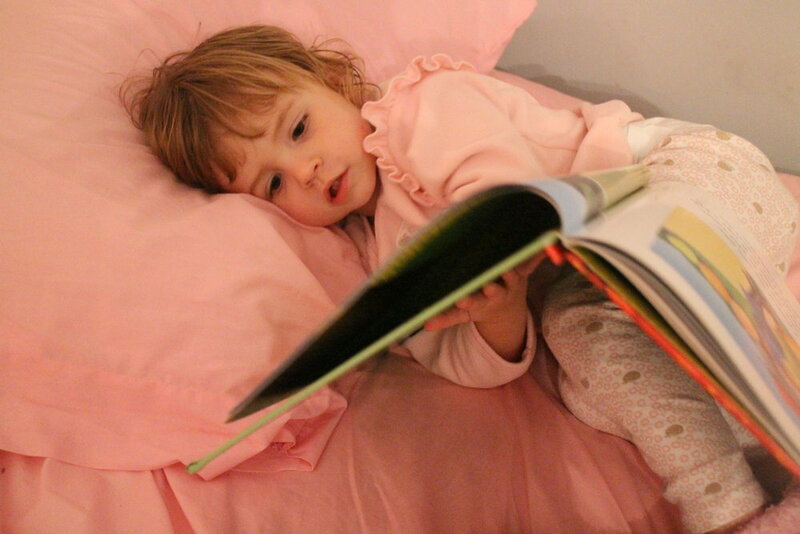 Do you have a bedtime routine that you practice with your kids? What does it look like? What benefits have you seen from it? Let us know in the comments below. About the AuthorKeli Garcia Allen is a certified Spanish teacher and currently works as a Preschool teacher in a bilingual classroom. She is the Head of Content for Learn Safari and is currently working on Spanish Safari, a Spanish Learning game for children 4-10 years old. You can follow her and the rest of the team on Facebook, Instagram, and Twitter.